Who Are The Seeds of Life? TO EMPOWER, EDUCATE, AND SUPPORT INDIVIDUALS WHO ARE REAWAKENING THEIR TRUE SELVES. TO BRING ABOUT THE NEW PARADIGM IN THE KITCHEN AND THE WAY WE CONSUME. Through working with the natural kingdom creating real food from fresh organic elements combined with intelligent movement & breath, leads us to the ultimate lifestyle where we begin to remember our place in the world. We are the custodians of this land and the bounty is for us to enjoy sustainably. This is what the Raw Living Foods/Plant Based movement means for us. Welcome to the Seeds of Life, where the focus is to support the reawakening of our true-self through creating the ultimate lifestyle. Activate your fullest potential via the very act of innerstanding what it means to truly live. This is happening, now, and you are a part of it. We combine the elements of fun, flavor, vibrancy and integrity through Raw Living Foods, Yoga and Holographic Kinetics, an omnipotent healing modality that exceeds all levels of what a holistic approach to understanding what this game of life is all about and what it means to be truly free. I speak from my own personal, transformational experience and hope to share it with you. We offer our service to you by combining over 25 years experience in the healing arts and food world, working in many different capacities providing Raw Chef Certification Programs, Our raw Food Cafe & Taoist Tonic Bar, Retreat Chefs for your event and various Workshops. Our strengths have been built on the foundations of Raw Chef Certifications, Yoga Retreats and Teacher Trainings, High End and Exclusive Functions, Small Intimate Dining Experiences, Workshops, Menu Consulting and Staff Training for many of the World’s great Leaders and Teachers in their respective fields and working with the innovative people operating ‘behind the scenes’ whom are facilitating great change. Raw Foods and Veganism have quickly become the latest buzz word and the most popular health trends on google. Why? What is it about our collective consciousness that has given rise to this movement right now? Well it seems some of us are not Thriving, or simply, many of us are looking for the edge in life to be the grand creators of our greatest dreams. As we look into the many ways of reaching our fullest potential, it makes sense that before we make huge investments and changes to our lives, we take a closer look at improving the things we are already doing Every Day. I know I eat every day, and if you do too then maybe it’s time for us to embrace the advancements in technology and look closer into what is means to ‘EAT’. This gives rise to our fully Vegan and Raw Food Cafe and Taoist Tonic Bar in Bali. Where we serve real food, approachable by everyone, and we are busy! People are rising to the occasion. They want their health back, they want a life. The numbers add up. Just typing in ‘Raw Food’ on Google, opens up for us a plethora of information and an abundance of peoples explanations and experiences on the definition of Raw Foods. Quite simply tho, Living Bodies need Living Foods to Thrive. Do you want to THRIVE! We did, but we didn’t want to be sentenced to a life of lettuce, carrot sticks and hummus. So we educated ourselves and did some training, (which we are passionate about sharing with you), and the world has never looked the same since, and for the better! 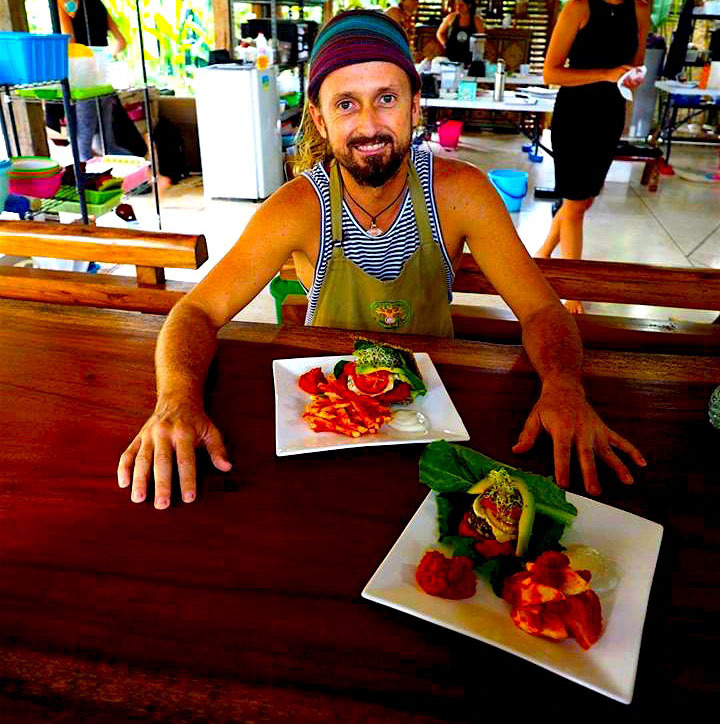 Head Chef, Owner and Founder of The Seeds of Life Cafe and Taoist Tonic Bar and creator of The Raw Food Academy in Bali. I’ve been living the Raw Food lifestyle to the fullest for over 8 years, completing over 50 fasts and vision quests from 1 day to 30 days, student of life, educator, holographic kinetics facilitator, body worker, practicing yogi, chocolatier, taoist tonic herbalist, certified tea master and certified at E Cornell for nutrition. Squeezing as much nectar from life with every breath. These are some of my current passions and tools that I see fit to educate others on their practical application to your culinary and life experience. It is all connected. Is it About 100% Raw or is it About 100% Health? What’s The Big Deal With Raw Foods? My Body Is Different To Other Peoples Bodies, Do I Really Need Raw Foods? Didn’t Dogma Get Run Over By Karma, How Do I Approach This Way Of Life? What’s Next, Can I Take It To Another Level? Do I Have to Give up Chocolate, Cakes and Other Tasty Delights? Can’t I Just Throw Any Foods Together in a Bowl and Dive in? Why am I Losing Weight on Raw Food? It is true that some of us can consume just about anything for our entire lives and show no visible signs of degradation. However just because we can eat processed foods doesn’t mean we have Adapted to them. Adaptation is a process that takes generations to achieve and looking around us today we can see how we are not Adapting to this ‘new’ brand of food. What is going to happen to our genetics as a result of this conditioning? Some of us are already feeling the pinch of poor food choices. The number 1 thing we denature through processing/heating that is most important to us are the Enzymes. We then lose up to 95%of the proteins(which are then mutated into other ‘things’) Sugars and starches(same same) are then mutated into things like acrylamide and so on. You don’t need a science degree to understand that what happens to these particulates when processed is they change from they’re natural state to an un-natural state. Natural bodies, natural foods. It means the information is readily available today to grasp with both hands your path to superior health whilst having heaps of fun being creative in the kitchen! Have you been trying to get on the program but find it hard to keep the momentum? Are you looking for that extra edge to take you existing program to the next level? So we might not be able to make it to the yoga mat or hit the pavement or gym everyday but we do eat – everyday. What if via that simple act of making conscious choices was an inner alchemy? If we can align ourselves with what serves us the most, common sense will tell us that – that is good. And as we are a part of the universe (believe it or not ;)) a universe that is self regulating, self sustainable and above all a system that sustains life, why would it not want to back us when we put out for it. We get what we ask for, universal law 101. Fundamentally we all need the same stuff, some need more than others some need less. However the basis is the same, we need nutrients. The mechanism of hunger is not one whereby we interpret this message from the brain(or somewhere, where is it?) as feed me anything, especially if its pizza, burgers, candy’s and so on. In fact this message is one whereby the body is telling us to feed it nutrients i.e. calcium, magnesium, vitamins, enzymes etc. SO! if we were to do exactly that by eating a handful of superfoods for example, our hunger would turn off. Maybe that’s a key to controlling our weight!? People can get obsessive about anything! One thing we would like to make clear is the importance of loving yourself enough to feel if something is working for you or not. We advise taking it slowly as you transition. Some of us can jump straight in there like we were raised on raw foods, others need a little time. And this might mean taking 10 years in transit. The most important thing is to increase the level of nutrition via conscious choices that will ultimately lead us to higher levels of awareness. So, what’s the point of all this? Is it just to eat great healthy food? I don’t think so, For me it’s about reaching my full potential, that’s the goal, that’s what I’m zeroing in on. Yoga Qi-Gong (or another cultivation practice), ultimate nutrition, conscious eating choices, laughing, good friends, a passion or 20, fresh air and water and free will. These are our birthrights and just the beginnings to what will follow if you stay on purpose. THE SEEDS OF LIFE are completely integrated at every level to ensure your experience is one of integral nourishment and that means we have the capacity to go as deep as you are willing. We have over 40 years of food handling, nutritional and healing experience between us to at least guide you on your path to the next level whether it be a professional raw food chef, retreat chef, open your own cafe/restaurant, a lifestyle enthusiast or even if you simply want to take your home prepared meals to the next level for your friends and family. It’s a lifestyle, so much more than just preparing food. We are well informed on super foods, natural supplementation, tonic herbal-ism, healing, lifestyle choices and making connections. Definitely not, in fact you will be pleasurably surprised to learn how to alchemise healthy raw chocolates, raw vegan cheese cakes, muffins, crepes, butters, frosting’s and virtually most variations to your favorite delights. We will show you the ease and importance of food combining. Foods are made from chemicals, albeit natural however they can and do react with each other. Even some foods that are less fibrous combined with higher fiber foods will want to break down quicker and ferment in the gut leading to indigestion, putrefaction, toxicity and acidosis. The best sources of protein for human consumption is repeatedly being shown to us through various studies (‘Becoming Raw’ by Vesanto Melina, Brenda Davis, & Ryan Barry is a great read) as being Raw Plant Based Proteins. Animal proteins, raw & especially cooked are linked to many health issues. They go on to say ‘saturated fats(cooked) cholesterol & destructive free radical reactions combined with the lack of fiber (to clean), fewer phytochemicals & few antioxidants challenge the idea of including animal protein in a human diet. The quality of protein is an essential consideration as is the amount. However a balance of amino acids are even more important. Amino acids are the building block of proteins which are necessary for supporting our immunity, cellular structures & bio-chemical reactions. b. multiply your body weight by 0.8. As we transition, most of us experience weight loss. It’s a natural part of the process, as for the majority of us we have built our bodies from foods that are not of the highest quality. What you will experience is the bodies incredible ability to heal and transform itself when given the chance. As we peel back the layers of the old foods (and the emotional attachments to those foods) and programs, the body starts to repair a rebuild itself on the new foundations it is being given. The body will then restore to its correct weight that it is required to, depending on the purpose whether it be for office or the gym. What is This Life Force and How Can I See it, Where is it Expressed? What Else Can I do to Optimize This New lifestyle? What do Raw and Living Food Lovers Drink? Doesn’t the Acidic ph of the Stomach Destroy Enzymes? Is This a “New” Fad Diet? Life force can be measured in and seen through Kirlean photography in absolutely anything. Life is animated by this life force or electricity and in foods, the life force as a measure is a property that allows something to be able to reproduce in nature. It is the living matrix that makes up that particular food. And it surrounds all living things, trees, water, rocks, seeds, fruits and you! It is a matter of life and death for us as living systems, that we eat foods that have this electrical charge of life itself and an abundance of enzymes. It’s all about the Enzymes, biological energy. As opposed to chemical (reactive) energy. Biological energy is that mysterious force in nature that drives all living things. The more biological energy we have the more we shine! The first step is education. There’s a lot of hocus pocus in the big bad world today, but the most self-empowering thing we can do is to find things out for ourselves so as we can truly be owners our experiences. Only you know what is right for you. We offer a fun and clear approach to a simple but fundamental act we do every day. Eating. And – SUPERFOODS!! less is more. For some it seems a little too ‘extravagant’ or ‘elitist’ to even grasp this ‘new category’ of foods. But what are they exactly? Simply, they are foods that have an abundance of beneficial nutrients. Like Cacao for example. Magnesium is up there as one of the most deficient minerals in humans today, cacao is one of, if not the highest natural sources of magnesium. Not to mention the other beneficial minerals and neurotransmitters that are of an abundance in raw cacao. Making raw chocolate with superfoods and tonic herbs, all of a sudden becomes a powerful and fun nutrient delivery system that’s a great way to get adults and kids making and consuming nutrients. Can I lick the bowl!! More and more ‘super-nutritious-foods’ are being discovered all the time as we uncover what it is in foods that makes them healthful. A small handful each of goji’s and bee pollen and a half a dropper full of marine-phytoplankton provides an excellent profile of proteins and amino acids for the our noble bodies. Remember, we don’t want to be eating all day just to get our nutrients, there’s more to life, we believe that with nutrition, it’s beneficial to adopt a ‘less is more approach’. Less amounts consumed = more nutrients, less time in the kitchen, more time for you. Superfoods are awesome, hooray for superfoods!! Tonic Herbalism is another self-empowering system we use every day to give us that lever-edge. So let’s be clear and realistic about this approach to health and vitality. We do not heat treat foods so as to maintain the integrity of the natural nutritional profile of the food i.e. Enzymes, Proteins, Life Force etc. Tonic herbalism, particularly a Taoist(connected, balanced) approach to tonic herbalism is focussed in on extracting different constituents from roots, barks, leaves etc. that our bodies do not have the bilic acids to extract and they can handle very high temperatures. Like polysaccharides for example, they can handle temperatures of up 250-340+deg C, also beta-glucans and sapponins. These allies are all very powerful and are necessary for immune support (supporting enervation, nerve force) for us. Some have Adaptogenic properties that have been used in various cultures for up to 5000years to bring about great health. We love tonic herbalism, and can show you the path to understanding more of this powerful system. Living Spring Water that we gather ourselves, fresh from the source. Freshly extracted juices consumed within minutes of extraction. Within minutes from extracting the juice or ‘life water’ from the fiber of the fruit or veg, ‘Zeta potential’ (measurement of energy within the degree of structure in a colloidal system) loss occurs and sediment or separation appears leaving free radicals behind, we don’t like to drink free radicals. Fresh coconut water bursting with electrolytes(mineral salts and acids) Superfood smoothies, Green smoothies, Structured Water. Colloidal mineral beverages and sprouted living Mylks made from activated seeds, sprouts and nuts. Foods that have not been processed in any way, shape or form are raw and living foods until they have been prepared over 118degF or 48degC. the terms are used loosely. Firstly they’re an individual who wants more from life, they want the edge, self-empowerment, clarity, we call it ‘the glow’. Secondly they’re a person who eats 75% or more living/raw food. The more, the better. Optimally one should eat 100% raw and living foods, if it feels right for them. Viktorus Kulvinskas, one of the world’s foremost and most experienced active researchers into enzyme nutrition has information showing how stomach acid merely deactivates food enzymes. The enzymes are then reactivated in the more alkaline small intestine. Many people who eating more or all raw foods, remark on the difference in our energy levels, lighter digestion and a deeper connection with nature by eating enzyme-rich living foods. When we remove cooked protein from our diet, our stomach doesn’t need to produce as much acid, (which has its own problems) thus creating a lighter, more balanced and energetic vehicle. When juicing or eating foods, it is very important to choose to consume only organically grown produce. “Conventional” or “industrial” produce are grown with pesticides, herbicides, synthetic fertilizers, and other chemicals that are toxic and/or harmful to your body. Organic foods are grown without the use of these harmful substances, taste better, and are more nutritious. No, but if you had the choice between nasty lab-made pesticides and healthful consciously grown foods, I bet your instincts would suggest the latter. It has been shown that organic produce contains less pesticides and other toxic residues. It’s worth mentioning that it has been shown that organic food may tastes better and contain more nutrition. Could it be that the flavor in food is the nutrition? OMG! I’m inclined to ask for a refund from all the non-organic produce that I have bought that was labelled healthy, tasty and delicious that has turned out to be otherwise. It can remove some of the surface pesticide residue, but not the pesticide that was the foundation for the produces growth cycle. Some of the most severely tainted types of produce are strawberries and bell peppers. Some of the least tainted: carrots and avocados. Considering we’ve been on the planet longer than fryer pans and ovens, I think not. Only now we’re able to get super creative and take all of those delicious gifts from nature to a whole new level. “Ben and Sayuri are two incredible high-energy vibrant individuals and the team they form together is one of a kind. Ben makes the intangible tangible, making abstract nutrition, health, and spiritual concepts surprisingly easy to understand. He brings together an immense background of knowledge and experience in the fields of raw food nutrition, Taoist tonic herbalism, and Holographic Kinetics. His greatest strength, however, is his innate ability to understand every individual he comes into contact with on a deep level, allowing him to help each person in the way that is best suited to his or her entire life situation. I can say firsthand that his culinary creations are creative and delicious, he is a powerful and effective educator, and his Holographic Kinetics healing is the most deeply powerful modality I have experienced in my life. Sayuri will light up a table full of people and warm their hearts with her smile alone, but once she serves you a meal of her extraordinary raw food delicacies, you will know the true meaning of soul food- food that nourishes, enlightens, enlivens, and empowers the soul itself. Having experienced gourmet raw food created by the greatest raw food chefs around the world, I can honestly say that no other chef’s creations come close to those of Sayuri in terms of creativity, presentation, deliciousness, and pure love content. Sign up for free recipes, detox tips, & HIGH VIBES!